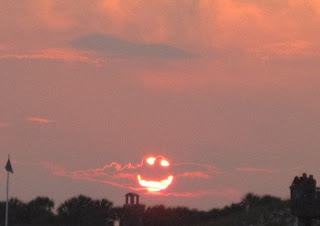 I don't know if this image is real or photo shopped or if it's a smiley face or the Cosmos laughing at us all. But it seemed appropriate. Musing Mother wrote a piece about friendship and I have read it again so I can absorb the message. Losing friends is never pleasant. It hurts and when I know the loss is real, I have to pause and feel the pain. Three times, now, I have been taken aback by women I have known for years thinking that I am not their cup of tea. Two, I have spent time with, face to face, broken bread with them and slept under the same roof. All three, I have known online for years. The two I had met in person, I held in great esteem and cared, deeply, about them and their opinion of me. It broke my heart to learn that someone else could take my thoughts and feelings that I express online and turn me and others into pariahs with them. MM was right. Sometimes it stings and sometimes it is an arrow to the heart. But we live through it. So, I ain't in with the in crowd no more, no way. I thought it might have been something I said until I realized they were just looking for something to use as an excuse to turn away from me. I could have said, "It's too hot out to worry about things, right now," and that would have been taken as something it wasn't just so they could slam the door of friendship in my face. All I had to do was have a certain tone to my emails or leave a word out of a comment and it was bye-bye, friendship, hello misunderstanding and hostility. I do want to make a point CRYSTAL clear to these ladies. I and the others you know, do not wish to withhold the rights of adopted people to their original birth certificates. And, when they have those documents, then they can ask their natural families for the medical information they need. But we should NOT be under the onus of a mandate to turn personal information over to any state. Neither should we be left open to frivolous lawsuits from adopters or punitive legal action from the state. If believing that we should be shown that minor courtesy and respect, if believing that we have already suffered enough from our loss, if deciding that being a real mother is not acting like a doormat for our adult children is wrong, then I don't want to be right. Personally, I don't believe any of that is wrong. Our raised children don't have the right to make those demands of us and neither should anyone else. I am tired of being a member of a misunderstood segment of the population just as I am sure our adult children are tired of being treated like eternal children. I am even more tired of being misunderstood and maligned and stabbed in the back by people for whom I cared. If I take any consolation in it, it is the fact that ever so often the deck of life is shuffled. My circle has grown, and I have new friends. The games go on with new players among the old. If a couple of cards drop from the deck, then maybe they were jokers. I have a widget on my blog that tells me when I am visited and where the visitors are from. Many of my readers find their way from ALLTOP, which lists the most read blogs and posts for each day. More often than not, my posts are in the top five most popular for that day. That's gratifying. I am just one person with one voice, but I have 70 "regulars" who think what I say may contain something they need to hear for good or ill. Sometimes I might not say what others would like to hear, but no one seems indifferent to my posts. But more than that, I have, here in my own home, my real life and it is a good one. Yes, it hurts to lose friends, but as I recently reflected, 5 years down the line, what is it going to matter? You don't get over losing a child, but you can move on after losing friends. To the two with whom I spent such lovely times, I will miss you and you know where I am if you ever need me. To the other....adios and I hope you are real proud of your work. That must have taken a lot of keyboard time. My hubby says it looks like a Jack-o-Lantern. LOL...I like that..creepy. Robin, yes - that is a creepy face - but the universe laughing - nice thought and probably true! Seriously - disagreeing is not the end of a friendship, it is the beginning of a true friendship. The only way they end is if the person disagreeing doesn't want to see that all of us are different in a thousand ways. While I don't always agree and even get offended at times, I respect you. I say good rce to bad rubbish! If they are unable to discern for themselves what the truth of a situation is, or read and make an educated GUESS, then they were not friends to begin with. I would rather know who my friends are, and not waste what precious little time I have with faux friends. And, I am your friend, and as long as we have a friend who cares about us, no matter what, then we are fortunate indeed. I love you, too, Girlfriend. trying to get the information they failed to get when I was a minor. Well, now the tide has turned and I am no longer a minor and will no longer be abused by anyone much less the state I lost my son in they can take a flying leap. Besides that he can ask me and I can tell him to his face, just like I do or would do with all my grown adults. It is sometimes so hard to comprehend how there in the States, adoption and all that goes with it has got it's knickers in such a twist.It just doesn't have to be this hard!! Friends...they come and go, some are keepers, some not, they all have their time and reveal their true faces, just give them time.